In our previous post we introduced Dr. Banting’s 25-word hypothesis and looked at the gross anatomy of the digestive system, the microscopic structure of the pancreas (e.g. acini, islets of Langerhans, β-cells) as well as the role of insulin in blood glucose regulation. Insulin in the form of pancreatic extract was successfully administered to a patient with diabetes for the first time on January 23rd, 1922 – 92 years ago today! Today, we will take a look at what insulin does at the cellular level to lower blood glucose. While most of this knowledge was acquired long after the first successful clinical trial, this blog post will help pave the way for a future discussion on type 1 and type 2 diabetes mellitus and will help us appreciate the significance of the discovery. The external environment (e.g. the bloodstream) is separated from the internal contents of the cell by a cell membrane. One of the proteins found embedded in this cell membrane is called the insulin receptor. Receptors receive and transmit signals to downstream components. Insulin (produced by the pancreatic β-cells) travels through the bloodstream, reaches a target cell and binds specifically to the insulin receptor on the cell membrane. 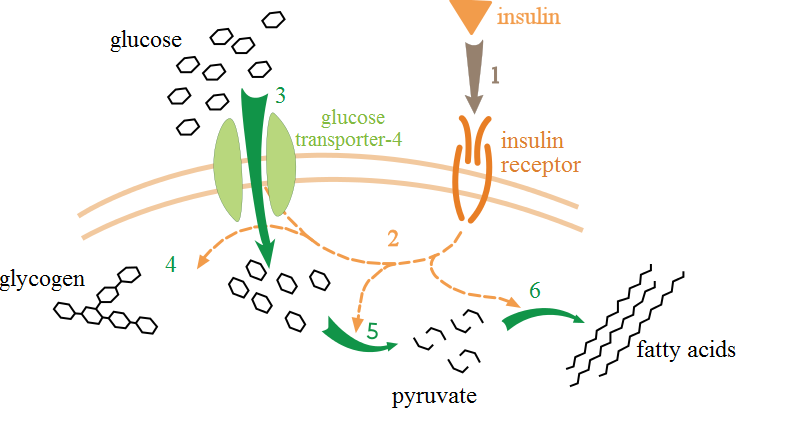 The insulin receptor in turn relays the signal to proteins found inside the cell (i.e. intracellular proteins). These proteins in turn promote the movement (translocation) of glucose transporters (e.g. Glucose transporter-4 or GLUT-4 in adipocytes) from the inside of the cell (i.e. the cytoplasm) to the surface of the cell, where they are inserted in the cell membrane. Glucose must bind to glucose transporters in order to cross the cell membrane. normal blood glucose range (i.e. euglycemia) is reestablished. If we think of insulin as the key, the insulin receptor as the lock and the glucose transporter as the door, then inserting the key into the lock (i.e. insulin binding to the insulin receptor) will allow us to open the door (glucose transporter) and move glucose from the outside (i.e. the bloodstream) to the inside (i.e. the cytoplasm), thus maintaining a healthy blood glucose range. Insulin, therefore, plays an important role in blood glucose regulation. Hyperglycemia results when the production and/or secretion of insulin by the pancreatic β-cells is deficient and insulin signaling is impaired such that glucose is not uptaken by target cells. Diabetes mellitus (DM) is a group of metabolic disorders whose underlying feature is hyperglycemia. The immune system of patients with type 1 DM targets and destroys pancreatic β-cells such that little or no insulin is produced. In patients with type 2 DM, target tissues become resistant to the effects of insulin and pancreatic β-cells become dysfunctional. While patients with type 2 DM produce some insulin, the amount is suboptimal for effective blood glucose regulation. If left untreated, hyperglycemia leads to various long-term complications. Patients with type 1 DM need to receive insulin injections. In contrast, not all patients with type 2 DM require insulin therapy. Type 1 and type 2 DM both involve hyperglycemia, but there are also significant differences. We will later take a look at these differences and the impact on insulin signaling in detail. 1. Marion, E.N., Mallatt J., & Wilhelm, P.B. (2008). Human Anatomy (5th ed.). San Francisco, CA: Pearson Benjamin Cummings. 2. Kumar V. et al. (2007). Robbins Basic Pathology (8th ed.). Philadelphia, PA: Saunders Elsevier. Posted in Uncategorized.Tagged anatomy, Banting, biology, Diabetes, endocrinology, glucose, hormones, Insulin, medicine, science.